Grand Decorative Ovals Card 2 will show you another way to make these Nestabilities work for you. The cost of these dies makes it well worth experimenting with them so that you can get the most from your purchase. It would be so easy to cut them out and just layer them up and then think that is all you can do with them ... but you would be so wrong. Think outside the intended purpose ... turn the cut shapes around, cut them up and use part of them, bend them into another shape. Play and enjoy them and relax as you do so. These are your dies and you can make the most of new ones that you may add to your collection. But look for dies that you know you will use time and time again and there are so many to choose from and the more you use them the better the price becomes. 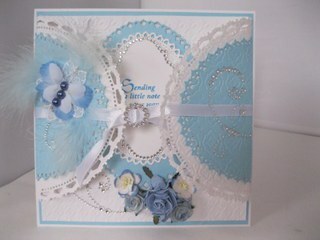 Let the short video tutorial show you how to create this beautiful card idea in easy steps. 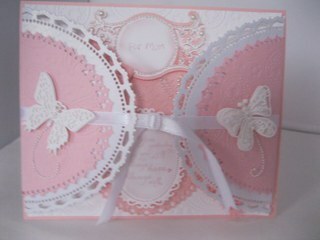 Then you too can make some stunning cards that you will be really proud to add your name to and give. How you dress up the card can make all the difference to the end result. And for me this is always the luxury touch. Please don't be afraid to try using your dies in lots of different ways. It is good to try these new things and it will build your confidence in cardmaking and give all your efforts the "Wow" factor. And nothing is more satisfying than the smile on someones face when they see your card and ask "Did you make this".... and you can say "Yes I did"
And remember it is only card and if you don't like it or make a mistake then there or ways to rectify that or simply throw it away and start again .... all part of the learning curve.